Soft, chewy chocolate chip cookies made with pudding to keep them soft! Perfect for dunking in a cold glass of milk, sandwiching around ice cream, or warm and gooey straight out of the oven. Hey there! I posted this recipe a while back, but I thought it deserved some new love and recognition. This is by far my most favorite recipe here on WMM and the pictures needed to match that! Plus I’ve included an easy step by step recipe video to show you just how easy it is. 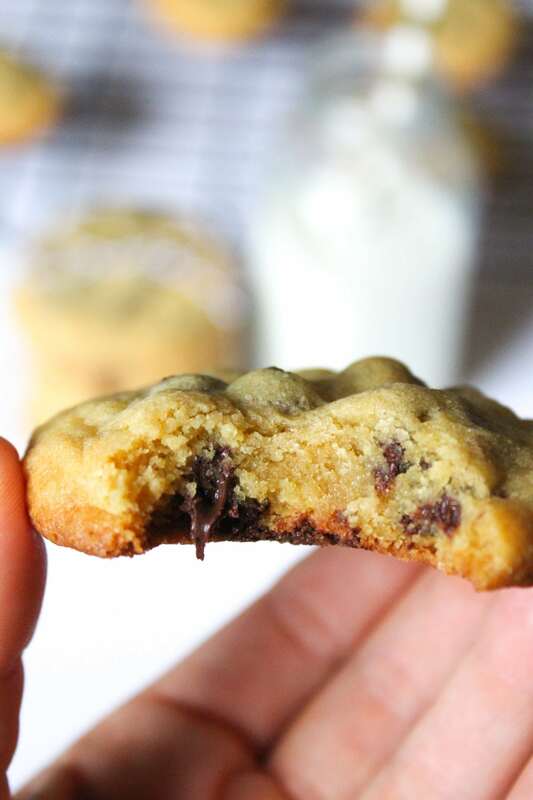 These chocolate chip pudding cookies are the softest and most delicious chocolate chip cookie recipe I’ve ever had and it really deserves to shine. They’re a favorite of anyone I make them for and the favorite of readers here on What Molly Made! On top of the video, I also went in to more detail about how you make these chocolate chip pudding cookies so perfect. I’ve made this recipe countless times and over the course of the last few years have nailed down the unique tips and tricks that made these cookies turn out perfect every time. I hop you enjoy them just as much as I do! I am part of the Food Blogger Cookie Swap and could not be happier to be a part of such a wonderful initiative to raise money for Cookies for Kids Cancer. This is my absolute most favorite cookie recipe that I’ve been making for years and number 3 in my week straight of Christmas cookies. Working with Cookies for Kids Cancer is a fantastic organization and is reason alone to be a part of this fabulous cookie swap, but I also get to share this experience with a number of other bloggers to bring all of you our favorite cookies. Like this one! I’ve been making these chocolate chip pudding cookies ever since an old friend’s mom gave me the pudding secret. At the time the pudding phenomenon was unheard of and it used to be “our secret ingredient.” Now everyone is hip to the wonderful ingredient that keeps these cookies so soft. I’ve spent a few years perfecting this recipe, but we finally found my favorite techniques through lots of trial and error. So I want to share them with you! Make sure to cream the butter with the brown sugar and granulated sugar for the allotted amount of time. When you cream the butter and sugar together the sugar cuts into the butter and creates air pockets. This is what makes the cookies bake tall and not spread everywhere. It also makes them so thick and chewy! Measure the flour correctly. To measure it perfectly, spoon the flour into the measuring cup then scrape it off the top. Use parchment paper! A silicone baking mat works well too, but I swear by parchment. It creates even baking and the cookies stay thick and chewy the whole time. Use 1/4 cup of cookie dough for each cookie. Yes, that’s a lot of cookie dough! But it’s what makes them so perfect and thick. You’re going to feel like it’s a lot but don’t worry, it’s the perfect amount. I like to roll my dough into a rustic looking ball, it doesn’t have to be perfect! I’m a sucker for soft-baked chocolate chip cookies. Emphasis on the soft-baked part. Give me a big crunchy cookie and I could pass it up any day of the week. As for the ingredients, nothing out of the ordinary or fancy schmanzy. Just the usual: flour, butter, baking soda, sugar, eggs, vanilla and love of course ❤️. Then comes the secret ingredient: the vanilla pudding. I promise these cookies will stay soft for days! If you want to make them in advance the cookie dough or the baked cookies freeze really well. Just cover in an air tight container and freeze for up to 3 months. The best part of these chocolate chip pudding cookies? They’re quick! They only take around 10 minutes in the oven, a few extra to cool and you’re ready to dunk in a big glass of milk! They’ll look a little undercooked when you take them out of the oven, but I promise they will finish cooking on the baking sheet. I always like my cookies just barely cooked so they are extra soft. The recipe makes about 14 cookies, so if you’re making them for a party or family I recommend doubling it to take to your event. But if not, I like to freeze the dough so I’m ready to take fresh baked cookies anywhere at the last minute. I always double this recipe when I make it so I can freeze half of the dough. But this time, I doubled it so I could send it to three fellow bloggers:) I packed them up, tied them with a bow and sent them on their way in the hopes to bring Christmas cheer to others across the country! I think this recipe holds the perfect amount of chocolate chips. There’s plenty of chocolate in every bite! The dough is thick enough to hold all the good stuff, so if you’re a chocolate lover feel free to add more. I know most people have their own favorite chocolate chip cookie recipe. But just in case you don’t, I highly recommend this one:). They’re so soft, extra chewy, deliciously-buttery and oozing with melted gooey chocolate. They make your house (or apartment in my case) smell magical and they melt in your mouth right out of the oven. This recipe is unfailing and you can always count on it to bake someone’s day, get some compliments at a party or as a pick me up just because. They make the best addition to your Christmas cookie spread and are a crowd pleaser all year round. They’re a go-to in my house and I’m sure you will make them countless times too! Preheat oven to 350 degrees. Line baking sheet with parchment paper and set aside. Using a stand or electric mixer, beat the butter and sugar on high speed until light and creamy, at least 3 minutes. Do not skip this step. Once combined, add the pudding mix, vanilla and eggs and beat on high for 2-3 minutes. Slowly add half of the dry ingredients to the wet ingredients and turn the mixer on low to start so the flour doesn't get everywhere. Turn the mixer up to high and mix until combined. Add the rest of the dry ingredients and repeat until dough is just combined. Add chocolate chips and stir with a rubber spatula until incorporated. Drop cookies by 1/4 cup onto the prepared baking sheet. Bake for 10-12 minutes, or until slightly golden and just set on the top. Allow to cool on the baking sheet for two minutes then transfer to a baking rack to cool completely.